Take the role of up and coming TV Reporter Ulala as she covers the invasion of the dance crazy Mororians. Can you out dance the aliens, save the planet and get the biggest scoop of your life? 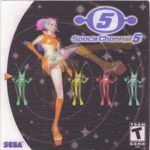 The game uses a watch and repeat style of rhythm action as you follow the dance moves of the aliens in order to rescue the world.